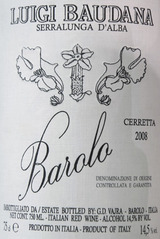 The result of these conditions is an austere and very mineral expression of Barolo. Aromas of dark cherries and raspberries jump out at you from the glass. Hints of cloves, new leather, iron and menthol add to the depth and intrigue of this wine. Refined and polished, Cerretta has an extra layer of tannins, important structure and a lively acidity which are nearly buried by its exquisitely lush fruit. Aromas of mint, white pepper and sawdust introduce flavors of cherry, strawberry and tobacco in this taut, linear red. Intense and balanced, building to a long, sinewy finish. Best from 2017 through 2037. 329 cases made.